Ever since my last encounter with John Long, a Bowlus owner who is also an accomplished photographer, I have been more curious about stereo or “3D” photography. John is one of the acknowledged experts on the subject and showed me the beautiful portfolio of stereo images that decorates his home. Now back in Tucson, I’ve started to play with 3D photography myself. 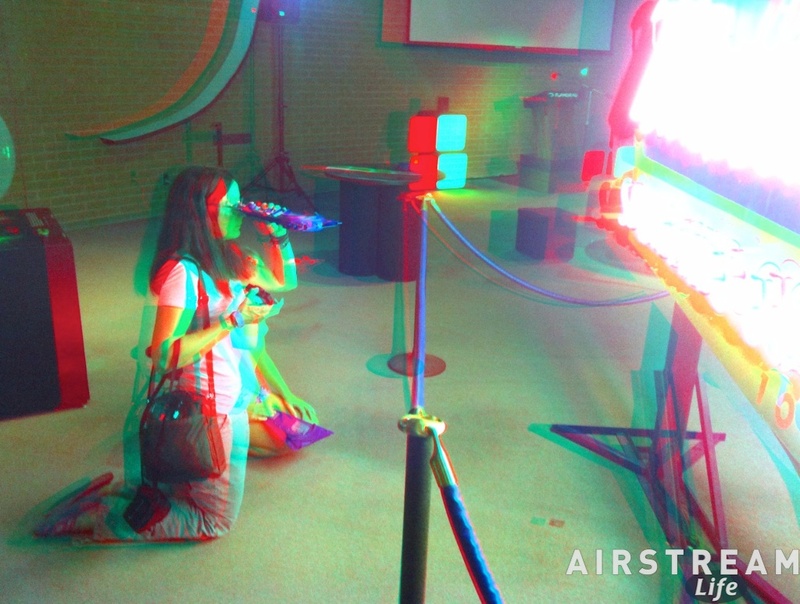 Composing a good stereo image is quite different from 2D photography, and it’s fun. 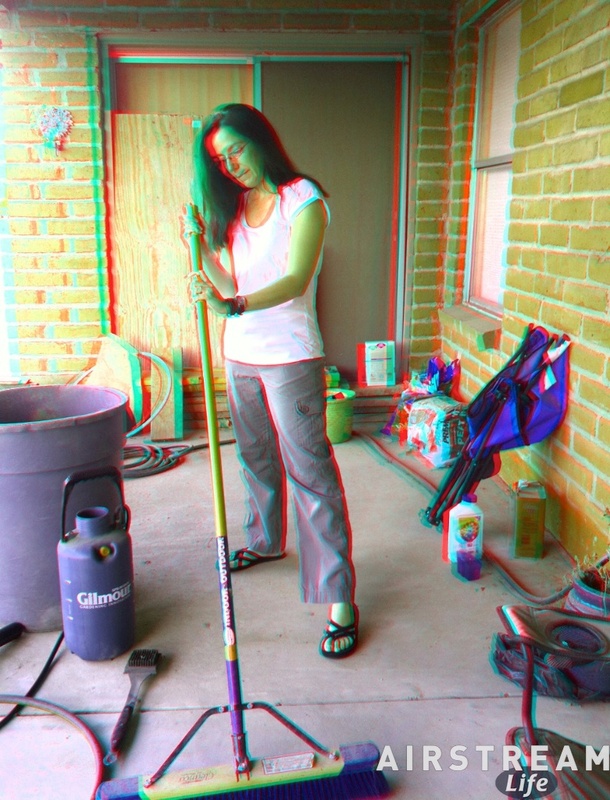 For practice purposes, I’ve been using “3D Camera,” which costs only a buck-ninety-nine. The photo quality is limited by the iPhone camera, but for learning how to compose a good stereo image it’s quick and easy. 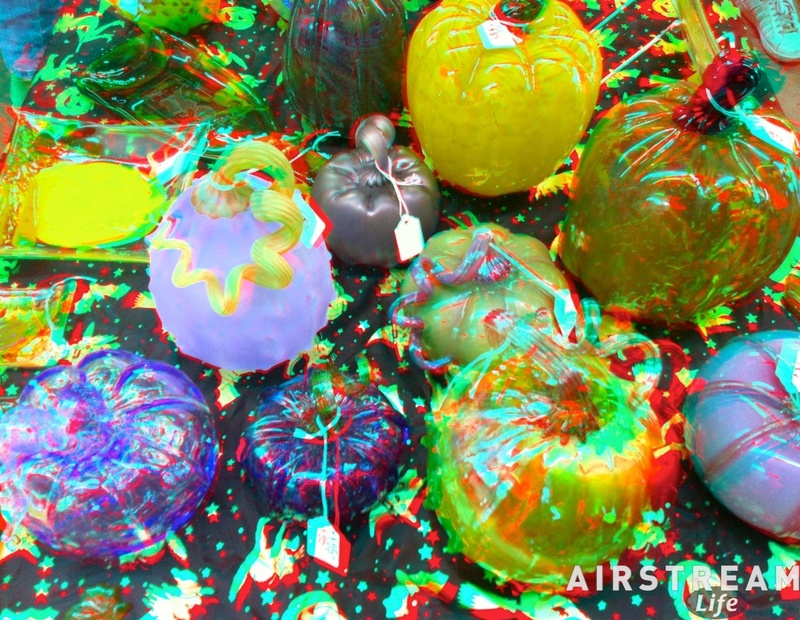 These images are all color anaglyphs, which means you’ll need a pair of those red-green glasses with paper frames. If you’ve bought a DVD in the past couple of years that is in 3D, there’s probably a pair of those glasses in the DVD case. If you don’t have a pair of those glasses, the image just looks blurry and crummy. Click on the images to enlarge them. This has been an interesting way to document the day. The weather has been spectacular in Tucson lately, with every day in the mid 70s. So we’ve been doing outdoor stuff and hitting the events of interest around town. Today we dropped in on the Flandrau Science Center at the University of Arizona for an exhibit on “gas” (meaning elemental gases, not gasoline). Sounds boring but it really wasn’t, since they kicked in plenty of neon. Above you can see Eleanor studying a neon sign through a spectroscope. I’ve learned that shooting people is difficult to do well in stereo unless you have the type of camera that shoots two images at once. With the iPhone I’m using the “cha cha” method, which means I shoot the left image, and then move the camera a few inches for the right image. In between the shots, you don’t want anything to move. As with HDR, still lifes are easier to shoot. Downstairs in the Flandrau is a permanent exhibit on minerals, which Eleanor and Emma always love for the many fantastic examples. For them, it’s like a prelude to the annual Tucson Gem Show. One of the photos here is a display case from the Mineral Museum. Our next stop was the Sonoran Glass Art Academy, where you can watch glass art being blown. Emma made a pumpkin with the leadership of one of the staff. It’s cooling in the kiln now, and we’ll pick it up in a few days. The photo here shows some of the other pumpkins that have been made. Once I feel I’ve gotten a handle on stereo composition, I’ll switch to the Nikon D90 and a stereo processing application on the Mac. This will take longer, but the results should be much better. 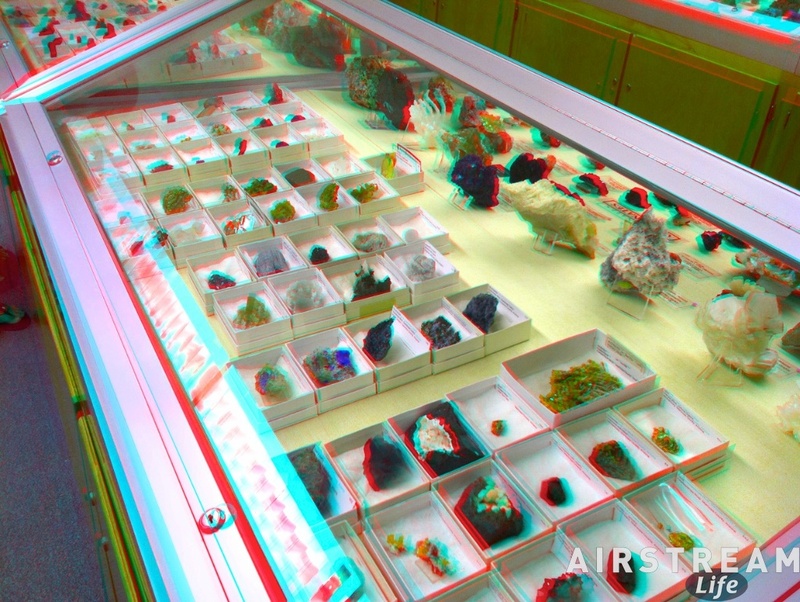 I’m tempted to upload more 3D images as I get better at the technique, but I don’t want to freak out the blog readers who don’t have access to anaglyphic glasses. So don’t expect more here. At some point I’ll open up a Flickr album for the best shots made with the Nikon and reference that for those who are interested. Last night Carlos and I went back out on the prowl for neon and other historic signs. We’ve been documenting the signs for over a year now, on and off. Now we’re nearly done, with over 80 separate sites documented by my camera so far. We picked up another five sites last night — a big night — in about two and a half hours of zipping from one location to another, rapid shooting with the Nikon, and then leaping into the car to race to the next spot before the light faded, like a pair of crazed scavenger hunters. We’re getting pretty good at it now. 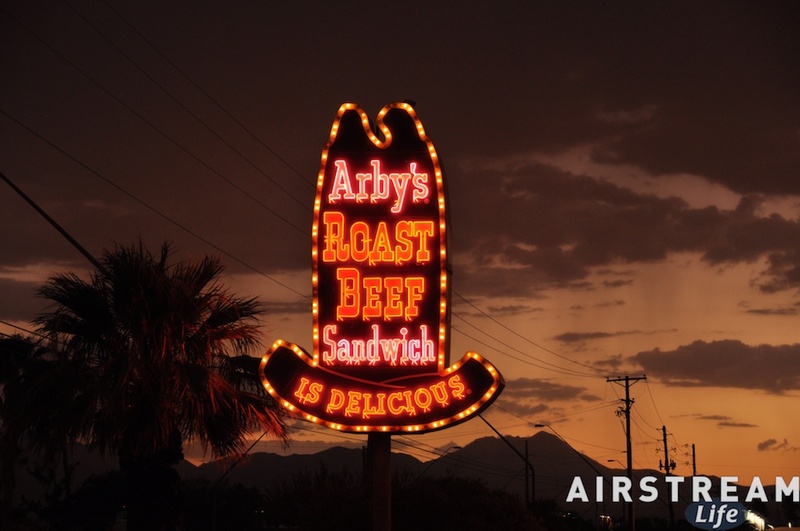 Carlos figures out a plan to hit the unlit signs in the “golden hour” before dark, works in some of the signs that combine neon and paint for twilight, and finally a route to all the neon signs that are still working in the darkness. I drive and take pictures. Tucson got aggressive about eliminating obnoxious signage after Life magazine printed a picture of one of our main boulevards and deemed it “the ugliest street in America. Unfortunately, the pendulum has swung the opposite way. Our historic buildings are nearly all gone, the dramatic neon signage that helped define the city is a mere shadow of its former glory, and that boulevard that was once the ugliest street in America has been promoted to being as ugly and generic as any other street overrun with retail chains. Progress has its price. In the past few months, Tucson finally passed the Historic Landmark Signs Ordinance, which amends the sign code to allow a narrowly-defined set of old and currently non-conforming signs to be taken down, refurbished, and returned to use. The idea is to keep the most historic, attractive, and irreplaceable old signs in Tucson, lest the town become just another piece of generic America. Since we started shooting these signs, we’ve noted that several have since disappeared, been horribly “tagged” by spray-painting vandals, or have been destroyed by neglect. There’s a sense of urgency to the project, as we can actually see the remnants of Tucson’s 50’s and 60’s era sign architecture vanishing as we work. It’s like we’re driving a 1960s muscle car with 1/8 of a tank of fuel remaining, and we can watch the fuel needle moving toward “E” as we search for a gas station. I find the job exciting because we are capturing history, depressing because we are watching it disappear, and inspiring because a lot of civic-minded people are volunteering their time to try to bring it back. I don’t yet know where this will end up, but we expect it will eventually become a book. 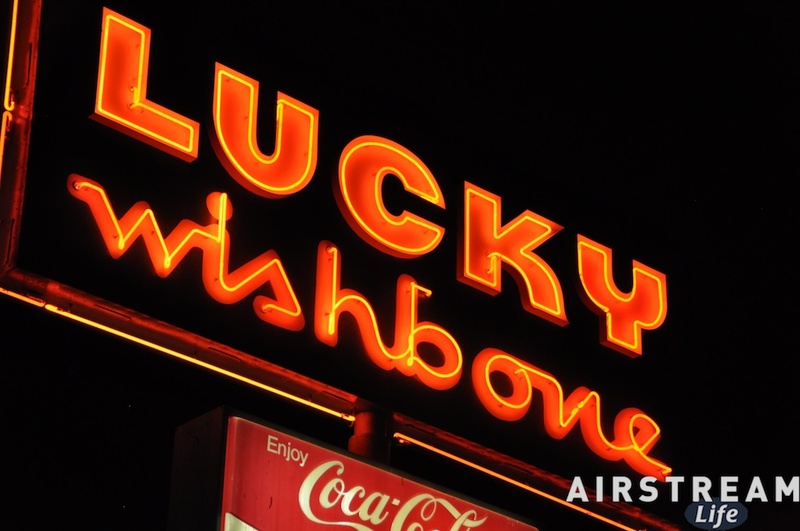 We’d like to raise awareness and appreciation of historic signs, especially neon. Much work lies ahead: organizing, researching, writing, designing, and probably fund-raising. Right now we’re just having fun documenting and researching. It may be years before this turns into something publishable, but that’s fine. It’s a journey and for me a wonderful tutorial on Tucson’s modern history, neighborhoods, and architecture. Not a bad way to spend a few 100-degree summer evenings. Living an Airstream you tend to be more attuned to the weather. Perhaps that’s because you’ve got less “house” surrounding you and therefore feel closer to the elements. 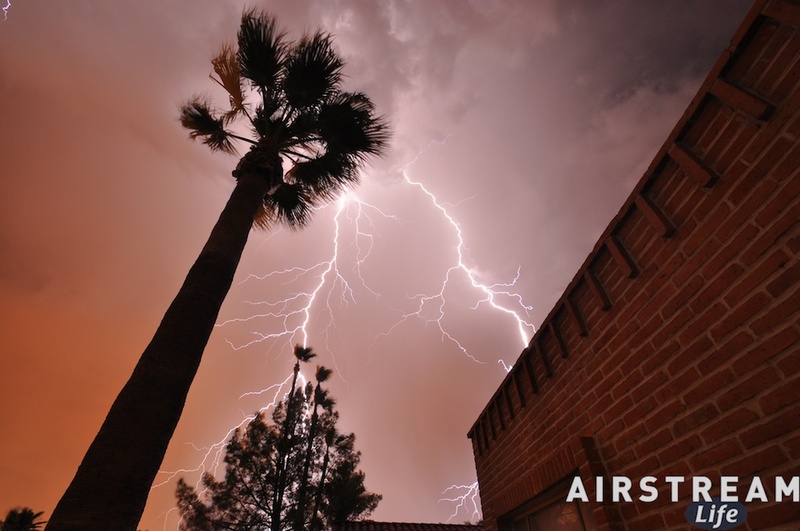 Two inches of fiberglass sandwiched by aluminum sheet is all that protects you from the threat of rain, snow, high winds or hail, and when precipitation comes down it makes a musical racket above your head. Whatever is happening out there is something you can’t easily ignore. This freaks people out at first, especially the first time they hear hail nuggets pinging off the aluminum, but eventually (I’ve found) the weather becomes an old friend that visits regularly, and rarely is it something to fear. 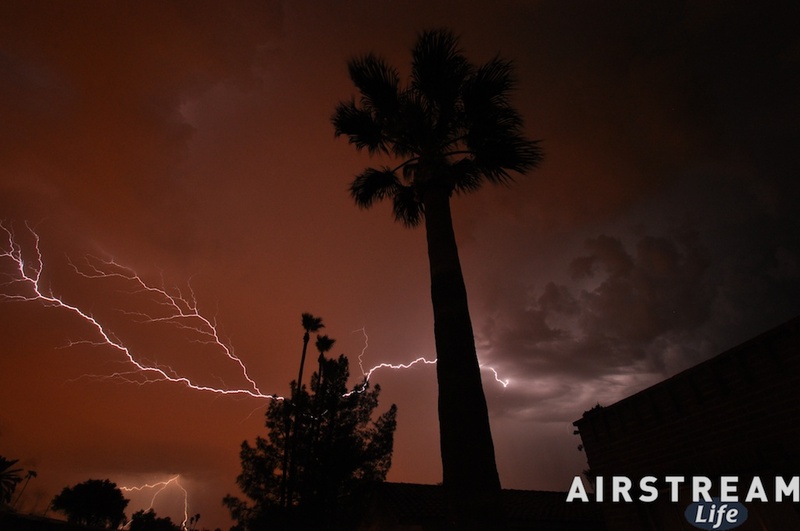 I particularly appreciate the sight of far-off lightning in the summer, which in the summer monsoon season of Arizona far outshines Fourth of July fireworks. Now, out of the Airstream, I still pay more attention to the weather than I used to. All summer I’ve been waiting for the perfect thunderstorms to come through Tucson. By my definition, the perfect thunderstorms are those that arrive after sunset and dance around the city about twenty miles away. They are discrete cells, surrounded by clear air, and often arrayed in a line that slowly marches by. When this happens, we can see the lightning show but avoid the rain and high wind, and conditions are perfect for nighttime photography. Eleanor had wanted to be here for such a night with hours of lightning. There was one lovely evening when we drove up the mountain to an overlook and watched a few distant storms, but I’ve written about that already. The “perfect” line did not occur before she flew back to Vermont, much to her regret. Last night I began to see rapid flashes through the closed shades on the windows. I had to go look from the front step, and sure enough it looked like a line of storms had set up to the south and west of Tucson. I could see at least three distinct storms, each flashing like fireflies so often that the sky lit up every 15-20 seconds. Even though I was dressed for bed, I had to grab the tripod and set up the camera. My usual lightning photography gear is the Nikon D90, tripod, Tamron 10-24 super wide angle lens, and a headlamp (so I can see to adjust camera settings). In this case, it was augmented by silk pajamas as I stood out on the concrete sidewalk in front of our house and snapped over a hundred time exposures ranging from 12 to 30 seconds. 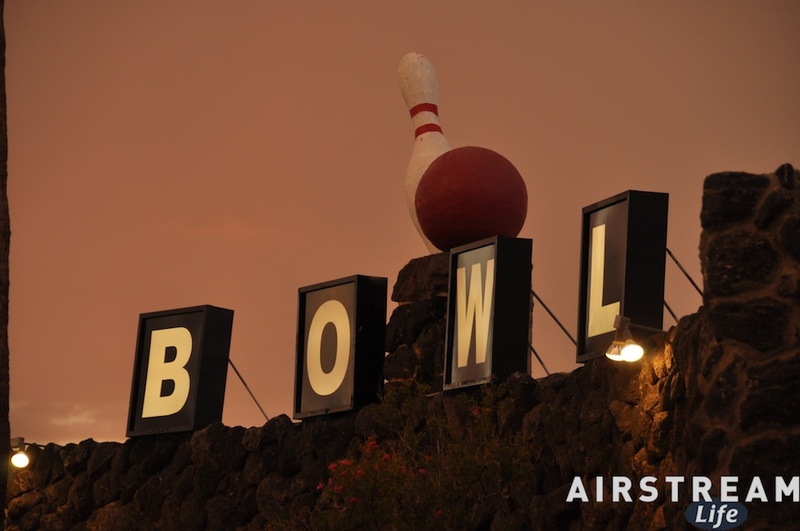 Unlike my session last summer, I opted to let the exposure run a little longer, so that the sodium lamp glow of Tucson would give the sky an orange-pink cast. This made a few lightning strikes over-expose, so after a particularly good and distinct bolt I would cover the lens with my hand until the timer ran out. Lightning photography is fun because you never know what you’ll get and it’s a constant chase game. The storms move across the sky, some peter out and others gain strength, and all you can do is try to guess where they’re going to hit next, set up an exposure, and hope for good luck. 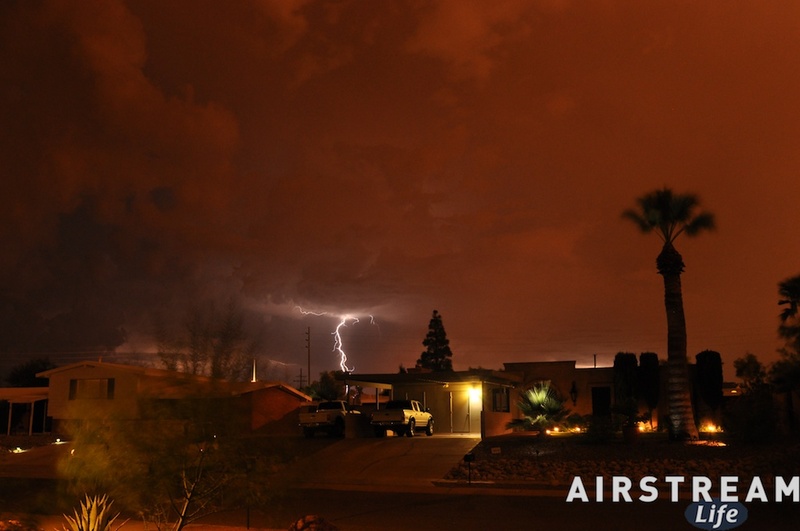 Southern Arizona monsoon storms help out by providing lots of lightning — much more than we get in the northeast — so even an amateur has hundreds of strikes to work with. The storms continued all night. I finally wrapped up my photo session around 11:30 when things seemed to be waning, but in the middle of the night a new set came through and woke me several times with ear-splitting crashes and house-shaking booms. At dawn another set came through, finally bringing us the first rain of the night. When I finally dragged myself out of bed, the ground was wet, the sky was gray, and the air felt like a Florida summer morning, ripe with humidity and the smell of things growing. It will stay like that for half the day, and then things will clear up back to the normal clear blue skies of the desert … until the next time. More photos from last night on Flickr. Just a quick note: The Vintage Trailer Jam has ended, very successfully, and we had a fabulous time. There were absolutely no problems related to the Phish concert on Sunday night, and the week was great fun. We’re back at summer home base in Vermont now. I’ll also add my photos later, and update this post when I do.